Old boats have always interested me much more than new ones. 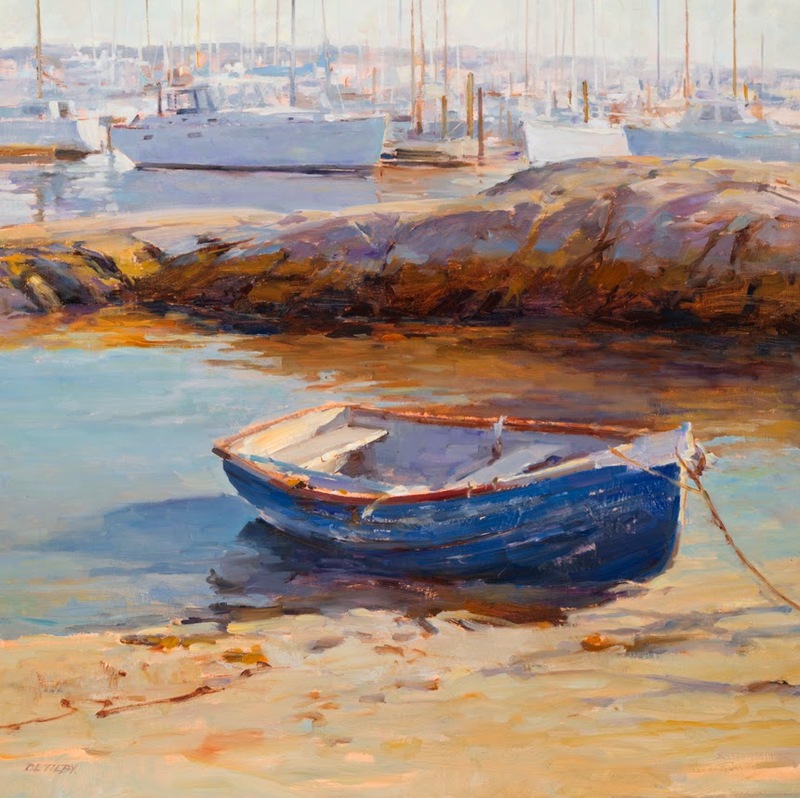 The weathered boards and peeling paint and odd bits of rope and cable one often finds around old boats attract me especially in Europe where even large fishing boats are left to tilt over on the sands when the tide goes out making them wonderful painting subjects. Rowboats left on beaches are particularly interesting but not easy to find around Victoria, BC. Most small boats have been dragged safely away from the water and overturned to keep out the rain. That’s why this one, at Oak Bay Marina, is a favourite because it’s owner leaves it sitting on the beach just like this. I often paint at the Marina but this painting was done in the studio. I rearranged the scene a fair bit to suit my composition; the background boats are from another part of the Marina and the rock has been resized and moved over. Colour wise I took the violets and blue greys of the foreground and repeated them in a simplified value pattern in the background boats. This painting was selected for third prize in the January BoldBrush Competition and has just been juried into the Oil Painters of America Western Regional Exhibition to be held in Carmel, California. Is there any option to purchase a print of this? I can make enquiries as to the cost of a gigclee print if you might be interested. It would probably be on paper (excellent quality) rather than canvas but either could be arranged. Let me know what you think.